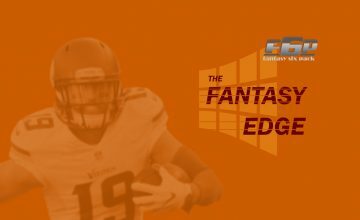 As we continue our 2018 Fantasy Football Team Previews, we turn our attention to the Cleveland Browns. The Browns are the first team to finish with a 0-16 record since the Lions accomplished this dubious feat in 2008, and the fourth team to finish a season winless since the 1970 NFL-AFL merger. In December, the Browns hired former Chiefs GM John Dorsey to overhaul the roster since the organization “didn’t get real players”. The Browns decided to retain Hue Jackson for some reason, even though he is now 1-31 as a Browns head coach. The organization has gone through multiple changes since last season as GM John Dorsey is trying to place his stamp on the organization. Todd Haley was hired immediately by the Browns as their offensive coordinator after his departure from the Steelers. A former head coach for the Chiefs, Haley will take over an offense that has ranked 31st and 32nd during Jackson’s tenure, according to Pro-Football-Reference.com. Haley’s offense flourished in Pittsburgh, finishing top-10 in points over the past four seasons. Dorsey has created some excitement in Cleveland. He acquired veteran quarterback Tyrod Taylor, wide receiver Jarvis Landry and running back Carlos Hyde. In the 2018 NFL Draft, the Browns selected quarterback Baker Mayfield No.1 overall to lead the Browns offense in the future. The Browns have dramatically improved their offense, this improvement should result in an increase in fantasy numbers. Unfortunately, the retirement of future Hall-of-Famer Joe Thomas created a huge hole on the left side of the line. The Browns really don’t have many good options to replace Thomas and will have Shon Coleman and second-round rookie Austin Corbett battle for the position. Are the Browns really improved? Will the Browns actually win a game? Does Baker Mayfield see action this season? Does he end up taking over for Taylor? What does all of this mean to fantasy owners? 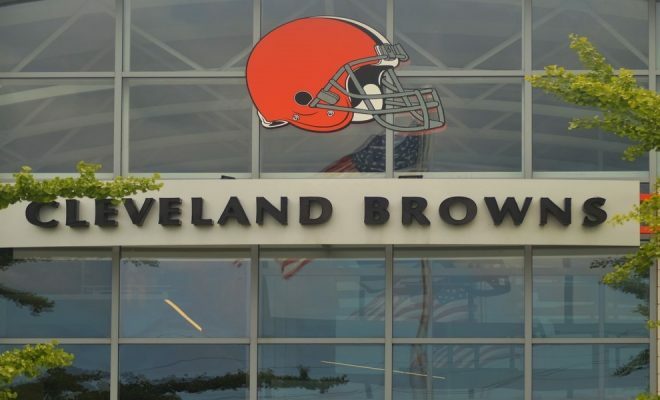 Find out the answers to those questions and a whole lot more as we look into the 2018 Cleveland Browns. Keep an eye on Tyrod Taylor for a huge year. In Tyrod Taylor's 3 seasons as a starter he has attempted 1236 passes. In the same time the #Browns with 8 different qbs attempted 1750! The Browns will go into the 2018 NFL season with their 29th starting quarterback in 20 years. Given how new offensive coordinator Todd Haley likes to push the ball downfield while taking advantage of a quarterback’s mobility. Tyrod Taylor seems to be a perfect fit. The Browns traded a third-round pick for Taylor, who was good enough to earn a Pro Bowl selection in his first season in Buffalo in 2015. He arrives in Cleveland after experiencing his first playoff action as a starter in 2017. Tyrod Taylor’s customary season in Buffalo was 3,000 yards passing, 18 TD, 6 INT, with 500 yards rushing, 5 TD. Taylor was limited by the lack of weapons in Buffalo, but he should not have that issue with the Browns. He will get to showcase his big arm with Josh Gordon, as his No.1 outside receiver. Additionally, he will be able to throw shorter routes with the newly acquired inside wideout Jarvis Landry. Taylor is proficient at working the ball downfield to his tight end, so we might see a David Njoku breakout in 2018. Lastly, the rushing attack of Hyde, Johnson Jr., and Chubb should benefit Taylor and the entire offense. In the short term, Taylor gives Cleveland the best chance to be competitive. Tyrod Taylor has one year left on his contract, and with Baker Mayfield looming, there is a very good chance Cleveland will not re-sign Taylor after this season. Taylor is auditioning for his next job. Look for Taylor to have his best season as a pro and delay any potential noise about Mayfield starting. Taylor’s ceiling is being drafted as QB1 in deep leagues. He should be owned in 2QB leagues. The Browns selected Baker Mayfield with the first pick in the 2018 NFL Draft, surprising almost everyone. Given Jackson’s disastrous decision to throw then rookie DeShone Kizer to start, it would make sense to not rush Mayfield into action. Hopefully, Jackson provides Taylor with a long leash to avoid the circus that will come about if the Browns struggle. Cleveland’s decision to pick Mayfield No.1 overall had more to do with his potential moving forward as a quarterback. His football IQ provides him the ability to make pre-snap reads and get rid of the ball quickly accurately. Those are the main reasons he completed 70 percent of his passes in 2017. He brings a different type of culture to the Browns, a winner with tons of swagger on the verge of cockiness that is needed for a team that has won only one game in their last 32 games. If everything goes as planned, we will not see Baker Mayfield for the Browns this season, but he will be their starting quarterback in 2019. Drew Stanton was brought in to help develop Mayfield. The veteran quarterback will be the third-string QB but will serve the duties of a coach/mentor and does not have any fantasy value. Over the last three years, two running backs have multiple seasons of 500 yards receiving. Le’Veon Bell has done it twice, last two seasons (600+ in each and three of the last four). Duke Johnson has done it in all three years (534, 514 & 693). Despite not winning a game last season, the Browns had a respectable running game. They finished 18th in yards rushing despite being 28th in total attempts. The Browns recorded a 4.5 yards per carry as a team, tied for third in the league with the Dallas Cowboys. The Browns will have a crowded backfield going into this season. They decided to pick up two running backs to share the backfield with Duke Johnson. They decided to sign Carlos Hyde to a three-year contract and then drafted Nick Chubb with the 35th overall pick. Carlos Hyde rushed for 938 yards (3.9 avg.) and 8 TD last season for the 49ers. His injury history does give cause for concern, but Hyde is likely to get the first shot at the early-down role. 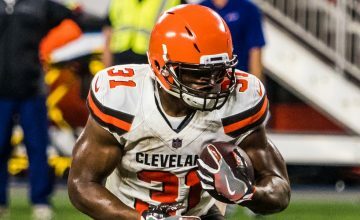 In a recent ESPN article previewing the rookie running backs, Browns reporter Pat McManamon said that Nick Chubb will get a long look to be the starting running back. If Chubb begins to outperform Hyde, it would not be a surprise to see him jump Hyde as the starter. It looks like we are heading to a “hot hand” approach to the Browns backfield, but Chubb looks like the one to own as your third back. The Browns gave their dual-threat back Duke Johnson a contract extension. In his first three years, Johnson has played in all 48 games and has rushed for 1,085 yards (4.2 avg.) and five touchdowns. He has caught 188 passes for 1,741 yards (9.3 avg.) and five touchdowns. Johnson will continue to play the same role as a change of pace back that is a movable chess piece. New OC Todd Haley will be creative using Johnson to create matchup nightmares for the opposing defenses. Johnson is a PPR stud that owners should select as their second back. Reporter: "Hey Jarvis, Josh Gordon just told us the Browns have the best receiving corps in the league." Jarvis Landry: "He ain't lying." When on the field, Josh Gordon is one of the best receivers in the NFL. In just 14 games in 2013, he led the league in receiving yards with 1,646 and that was with an unsteady quarterback situation. Since 2013, Gordon has played a total of 10 games and compiled 638 yards and one touchdown. Gordon is one of the most physically gifted receivers and it seems that he has cleaned up his personal life. The Browns hoped to have found a stable situation at quarterback, making Gordon full of upside for a top-10 season. However, the all of the sudden crowded receiving options for the Browns might limit Gordon to not live up to his lofty current ADP of 3.07. The Browns traded for Jarvis Landry and then signed him to an extension through the 2023 season. He led the NFL last season with a career-high 112 receptions and finished with 987 yards and nine touchdowns (also a career high). Landry has not missed a game in his four seasons and is constantly around the 100 reception and 1,000-yard mark each season. Don’t pay for the career year for Jarvis Landry. He had 161 targets (third best) and a 27.4 percent target share (seventh best) last season. Those numbers will be difficult to repeat with the multiple passing options available in the Browns offense. Corey Coleman has underwhelmed in two injury-plagued seasons and has had some issues with drops. He is fast but needs to improve his concentration. Selected in the fourth round, Antonio Callaway was selected lower based upon off-field issues. He is expected to push Corey Coleman for snaps in three-wide sets. Neither of these receivers is fantasy relevant presently. 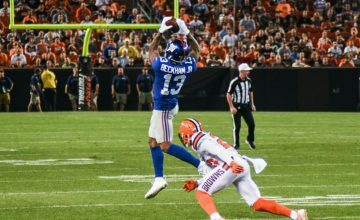 Outside of Evan Engram, which second-year TE do you think will have the best fantasy season in 2018? The Browns roster looks promising at the tight end position. David Njoku and Seth DeValve return to the roster as two big receiving threats after combining for 65 catches, which turned into 681 yards and five touchdowns during the 2017 season. The team also signed elite blocking tight end Darren Fells in free agency. During his four-year career, he has totaled 57 catches for 713 yards and seven touchdowns. A year ago, the Cleveland Browns made Miami tight end David Njoku the No. 29 overall selection in the 2017 NFL Draft. Njoku battled issues with drops throughout training camping in 2017 but found a groove as the regular season continued, eventually becoming the Browns’ top touchdown receiver with four. He caught 32 of his 58 targets for 386 yards as a rookie and definitely showed progress as the season wore on. Even in his limited action in 2017, Njoku graded out as PFF’s 10th-best receiving tight end. He also had the fourth-best average depth of target (11.6 yards) among all tight ends who played at least 50 percent of their team’s snaps. His athleticism jumped off the screen, and a step forward should be expected during his second season especially if he can develop some early chemistry with new quarterback Tyrod Taylor. Taylor loves throwing to his tight ends, see Charles Clay. Despite the ineffectiveness of the Browns’ quarterbacks last season, Seth DeValve registered 33 catches, which turned into 395 yards and one touchdown. His 395 yards were second-most on the team last season. Based on Haley’s track record, he prefers to use three wide receivers set instead of two tight end sets. The snap count for DeValve will likely go down in 2018, nixing any type of fantasy value in 2018. The Cleveland Browns have got much better on both sides of the ball coming into this season. With new offensive coordinator Todd Haley and new quarterback Tyrod Taylor leading the offense, the Browns should actually win some games this season. Coach Hue Jackson somehow survived a record of 1-31 in the last two seasons. With the offensive additions and giving up the play-calling duties should provide Jackson with no more excuses in leading the Browns to some wins. The question now is how many wins? 1? 2? 5-7? Browns’ fans will be glad if the team wins any games, so they don’t want to be too greedy. The offense will be greatly improved and fantasy owners will actually be glad to have more than one Brown in their fantasy lineup. When is the last time you heard that? I see the Browns winning six games, but then again I am a long-time suffering Browns fan so I need something to believe in.